I bought it, read it, did the worksheets, and applied what I've learned. 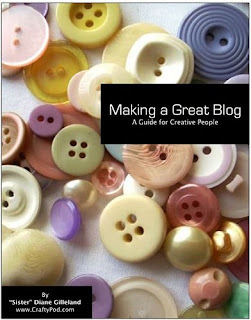 Now its time for the review of Making a Great Blog: A Guide for Creative People by "Sister" Diane Gilleland. She also writes my favorite blog ever, Crafty Pod. At $12.50, this e-book is a must-have for crafty bloggers! I've had several blogs since I discovered blogging, but after reading about adsense, blogging for business, and driving traffic etc, they weren't fun anymore, I couldn't think of anything "good enough" to write about, and they just died. Thanks to Diane's e-book, I have turned my original blog around, and blogging is fun again! Through the worksheets, I pondered why I want to blog, my goals, brainstormed ideas, and discovered that my blog shouldn't be about me. All the traffic stuff I was worried about before is happening all by itself thanks to this new approach. How to build an interesting and valuable blog. How to create great blog posts and great photographs. How to keep your blogging inspiration flowing over time. The do’s and don’ts of blogger etiquette. This e-book is great for someone who is just getting started, or to refresh the blog of a veteran. Thanks, Diane!